The Hunter's Blades Trilogy is a fantasy trilogy by American writer R.A. Salvatore. It follows the Paths of Darkness series and is composed of three books, The Thousand Orcs, The Lone Drow, and The Two Swords.The Two Swords was Salvatore's 17th work concerning one of his most famous characters, Drizzt Do'Urden. 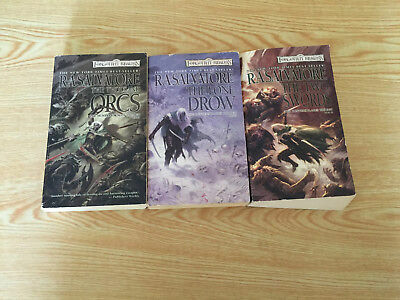 In this series, Drizzt takes a stand to stop the spread of chaos and war by an overambitious orc king across Drizzt's adopted homeland.The series reached the New York Times bestseller list.